Over the summer, I lived and breathed nature. Awakening to hear coyotes was both exhilarating and comforting; time was measured by light from the sun and the moon. After working all day in the rain, I would greet my tent covered in mud, somewhat optimistic about returning to the bush the following day. If strange lunch items fell between leaves, they would be eaten, for fear of lost calories. Insect bites would often cover my arms, and bathing in the small stream nearby was not only a refreshing event, but also an opportunity to maintain good hygiene. During one of our days off, a friend prepared for a backyard fishing opportunity. I helped in the pursuit of invertebrate bait. Impeccable at identifying native worm habitat, I upturned decaying logs and moist rock beds. Upon finding worms, I would promptly beckon Matt to pick up his prized bait, myself squirming as much as the sacrificial worms. One month later, in September, when I received my worms, I had no hesitation in putting my hands into the bag of squirming red wigglers. Until today, I hadn’t given this much thought. Slimy, wet, wriggling worms slither through my fingers as I turn the mixture of compost and castings, and it seems that my commitment to the ecosystem of vermicomposting has vanquished the superficial aversion I had previously held towards these innocent beings. And so I realize that as humans, our perceptions can be arbitrary, based entirely on imagined reactions to avoided interactions. Decisions, however simple, are motivated less by reason and more by personal interest. It becomes the responsibility of the individual to identify that which is worth challenging, and it is solely within the individual that change can be sought. So picture emJ, doing her thing, cleaning her room. Out of the corner of her eye she sees this little line of brown chilling on the floor. It’s moist, slithery, sleek, and awesome. This conquistador of carpet is about to check out the laundry basket, obviously sensing some leftover pocket snacks. I’m notorious for pocketing loose snacks, ranging from broccoli to chocolate chips, and pulling them out at the most casual of moments. Throughout the hustle and bustle of my busy days, I sometimes forget a raisin or two. It brings me incredible joy to see my worms exploring the world. I’ve lived out in the bush for a period of time long enough to confuse me in this somewhat familiar modern world of computers and instant communication. My “re-entry into society,” as friends call it, leaves me longing for my former days of the fantastic oddities of nature. Well, they’re still here, sneaking out from under my closet door. Smiling, I picked up the adventuresome wiggler, pulling the bin out of the closet a few feet away. As delicious as my dried mango nugget might have been, it was time for this worm to go home. There’s been a flurry and slurry of activity in the bin of worms! It’s been about four weeks; as such, the ecosystem is in full tilt. There’s lots of benign microorganisms working their magic in my plastic bin of deliciousness, including mites, nematodes, fruit flies, and my prized red wigglers. While there’s a healthy amount of worm castings (digested food) scattered within the bin, there’s also a lot of food that they haven’t yet migrated towards. If it weren’t for the putrid smell that emanated from my closet, I would not have been concerned. 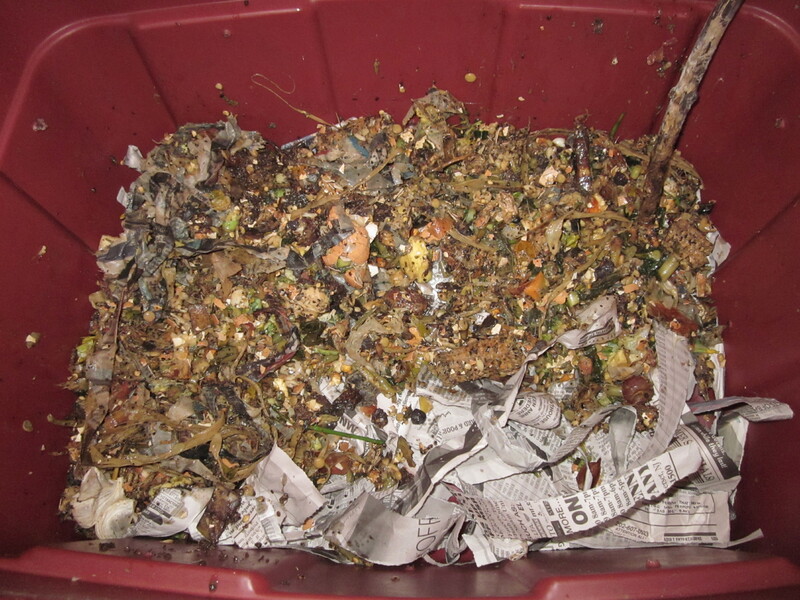 There’s a few reasons that vermicompost smells; fortunately, a stinky bin is probably the easiest issue to evaluate. It can be caused by high acidity, excess rotting food, insufficient ventilation, or excess moisture. Excess moisture, in the case of compost, is stagnant water, also called “compost tea.” Although it is a little disgusting, compost tea is incredibly beneficial to soils. Unfortunately, this excess liquid is no good for the worms, and also stinks a whole lot. With a bit of digging around, I determined that there was a lot of moisture sitting on the bottom of the bin. Not good! This is partially because I have added a bit too much food, but mostly due to improper drainage. 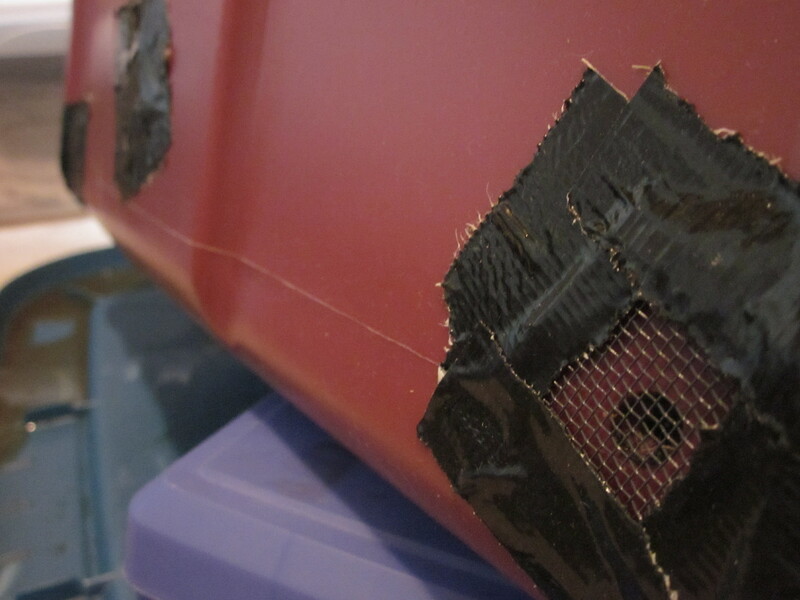 To maintain good drainage and ventilation, I poked a bunch of holes throughout the bin, including on the bottom. These screened holes allow air to pass through, water to seep out, and worms to stay in! It seems as though a few of my screens along the bottom of the bin had become clogged. Not good! Prior to determining the issue as clogged corner screens, I tried a few creative methods for moisture removal. Initially, I propped the bin up so that the water flowed through an unclogged corner screen. This worked until I clogged my last clear corner. I tried using my window fan to dry things out, which was marginally effective, but stunk enough to make me lightheaded. Next, I left the lid open, mixing around the compost and allowing some evaporation. This would have never worked, but was a feeble attempt while I stalled to dig in with my hands. If I’d had a turkey baster, this would have worked like a charm. Being a selective omnivore who never bastes turkey, I didn’t have this tool. One of those little chemistry droppers would have also worked. In the absence of such tools, I entertained the blasphemous idea of using a straw to catch the moisture. I’d watched my father use a big tube to create suction while draining the fish tank when I was little, and decided that it was totally feasible to pull up some of the compost tea with a straw. In my mind, I would simply employ a most precise amount of suction that stopped the tea before it entered my mouth. I came very close to implementing this horrendous idea; fortunately, I questioned my irrational ambitions when I realized that my straw was only a few inches long, my compost a few inches deep. I make myself laugh thinking about it. Alas, my hands smell like compost. I dug out the corner, cut a big hole for the water to drain through, and left the bin propped for drainage. After having spent a few days on the potential issue, I’m pretty happy to have solved the problem, at least for now. Although some of my worms got excited about an open bin and tried their hand at living the carpeted life, I’m sure they’re all very happy to have moisture equilibrium. I’m ashamed to admit that during my undergrad, I thought that the garbage disposal system in the sink composted my food. I was incredibly naive. I didn’t even know what composting meant. 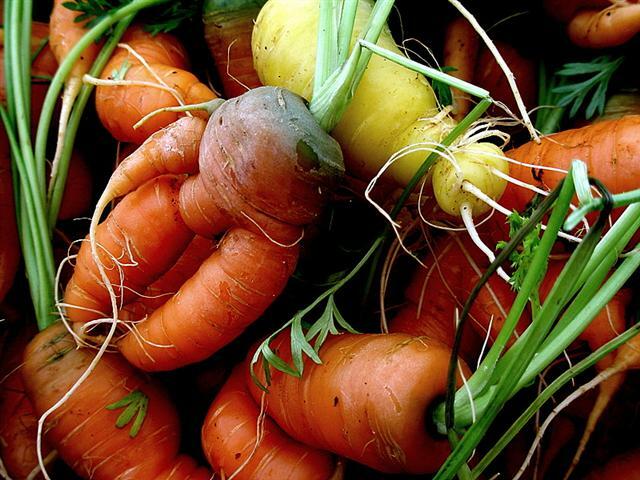 I was one of those fortunate suburban children who got delicious baby carrots in her lunch, but never thought about the similarities between plant roots and carrots. As much as I longed for Gushers and other deliciously artificial diabetes inducing snacks, I am now incredibly grateful for my parents’ healthful regulations. Somehow I’ve had the exhausting fortune of looking into the theoretical life of the Baby Carrot. A large portion of the time, I just get pissed off about the innocent Baby Carrot shreddings that get lost in the production of a dramatically shaved vegetable, a vegetable that somewhat resembles the flavor of a true carrot but mostly mimics the shape of a cheese doodle that drips with water for reasons unknown. Two years ago, I was introduced to a three-point waste system: trash, recycling, and compost. At the time, I wasn’t really responsible for the disposal of the compost, thus it was a simple reshaping of my mindset. Soda can? Recycling. Spoiled spinach? Compost. Excess paper towels? Trash. Although quite simple and user friendly, this system yields striking results. Composting reminds me of what I’m (not) wasting. When my food waste exceeds the demands of my worms, I’m wasting too much food. Lots of resources go into the production of food, and to let food spoil indicates my lack of appreciation for the goodness that our Earth is currently able to offer. It becomes a simple little game for myself– eat all of the food before it spoils. Some of my friends might give me heat for eating nearly rotting vegetables (it is important to note that my only encounter with food poisoning was due to poor water quality), but I enjoy challenging myself and making use of my money well spent. Vermicompost is great fertilizer! Most fertilizers that we currently use contain harsh chemicals that dramatically damage soils, both locally and globally. Much like antibiotics stripping the body of our good bacteria, fertilizers kill off nearly all of the beneficial microorganisms that allow our soils to provide such nutritious vegetables. Without these beneficial microorganisms, our ecosystems are less able to fight disease and invasion. Moreover, when the chemicals in fertilizers don’t get absorbed in the soil (which happens very often), they leach into our water sources. Leaching of fertilizers decreases our water quality, alters wetland ecosystems, and kills plants and fish. As the government subsidizes huge corporations that use these fertilizers, current policies on regulating fertilizer use aren’t in effect. While I can’t do anything about these policies (yet), I can at least do my part by reducing my overall waste and giving back to the soil in a constructive way. It’s true! This week, 1000 worms arrived on my doorstep, courtesy of Uncle Jim’s Worm Farm and the US Postal Service. I was ecstatic to find company in 1000 new friends (even if by default), and quickly pulled out the essentials for the start-up operation, rolling up my sleeves and settling in on the kitchen floor. worm bin. Keep those wigglers contained! Mine is the plastic variety, a lidded 21″x15″x12″ Rubbermaid, with screened ventilation holes and tray to catch residual moisture. newspaper. 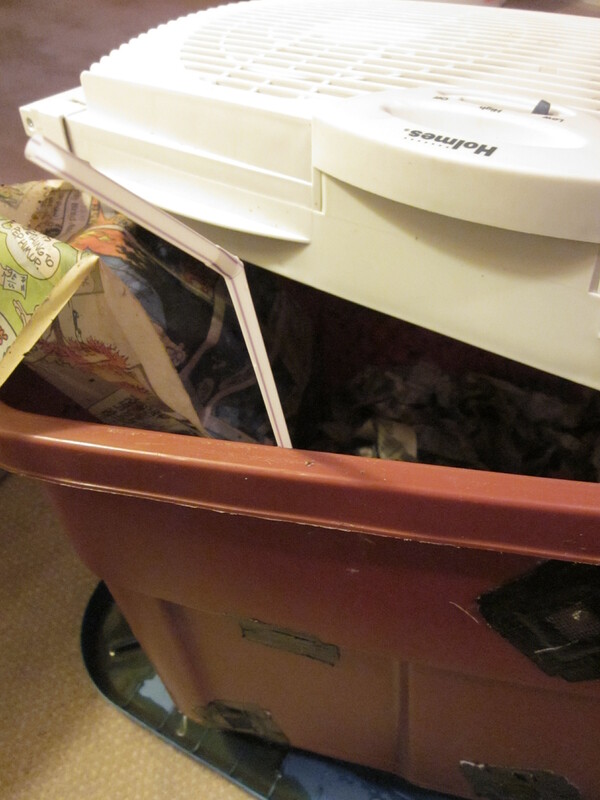 This will serve as worm “bedding.” I ripped newspaper into 1″ strips, enough to cover the area of the bin in two layers. thin cardboard layer. 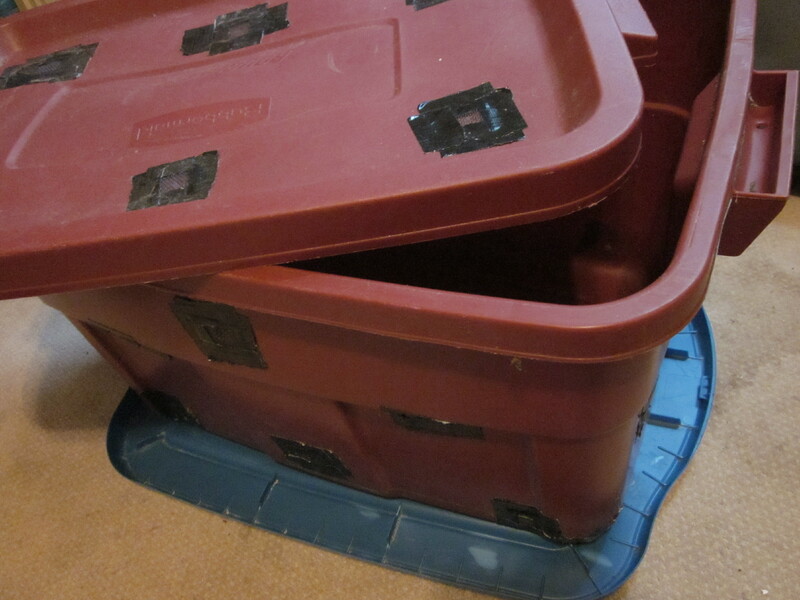 I use a 21″x15″ piece of cardboard (from my Zazz 12-pack) as a top layer to the worm bin. big stick. I like to use a stick to dig around, instead of using my hands. food scraps! I started out with about a half-gallon of three-week-old food scraps, plant material only. worms! Red Wigglers are highly efficient with food waste, so I bought 1000. Sure, they cost money. Coincidentally, dollar bills could also be used as worm bedding, but I spend wisely. First, I put a layer of shredded newspaper on the bottom of the bin. This would serve to absorb excess moisture from the compost. I then held my breath and scattered the nutritious fuel over 80% of the area, leaving some newspaper exposed in one corner (see photo below). Next, I scattered the worms gently over the compost material, finally covering the worms with another layer of newspaper bedding. Lastly, I sprayed some water on the top layer of newspaper, to allow the worms a bit of breathing area as needed. I also put the cardboard layer atop the last layer of bedding. The opening ceremony was quiet and anti-climactic, yet my nerdy heart still burst with excitement. The room smelled for a while, so brought the worms outside and lit some matches in the kitchen. A few hours later, after cleaning off the rain from the lid (oops…), I brought my nice red bin into my bedroom and put it right into my closet! This was almost a week ago; since then, the worms have settled in and adjusted to their new life well. Currently, the bin is as little too moist, but I’m working on this. The best part is that they don’t really smell! Sometimes when I open the closet door and really sniff around, I my nose knows that there’s something funky going on. Otherwise, it’s just a funny looking container that takes up space! 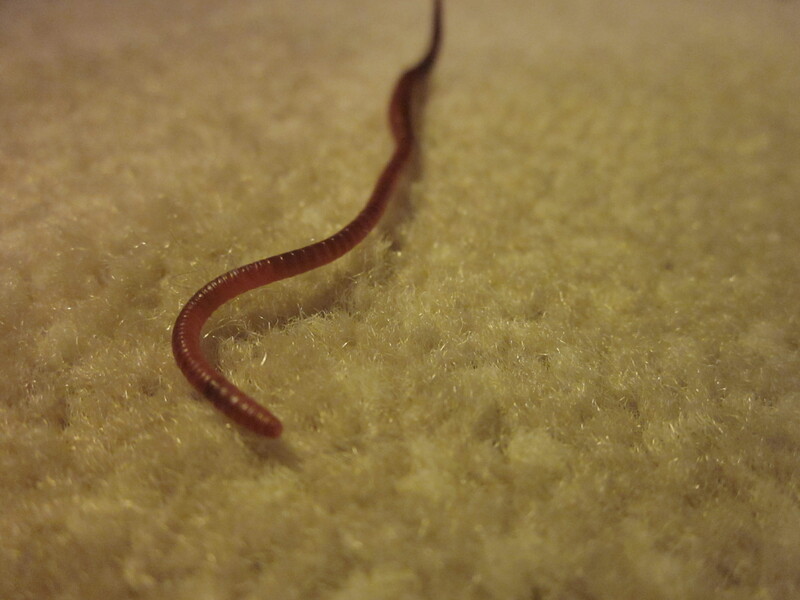 It might be pertinent to note that currently, worms are not in my closet. After having moved into my new place three weeks ago, I’ve been slowly settling in, re-adjusting to the stable amenities that the majority of society has enjoyed over the past two years. For example, I finally re-learned how to turn on the television today, something I hadn’t done since January. After about two minutes of getting annoyed by the small buttons on the remote, I turned the machine off. Since my arrival into this urban dreamland, I’ve been saving my food scraps. When the worms arrive later this week, my food will have already started decomposing, which will allow them to feast immediately. Under the sink, I’ve got a two gallon bucket holding the decomposing food (the bin will serve as a holding area for food only, which is different than my aerated plastic vermicomposting bin, currently vacant). As much as I don’t want to, I’d like to now talk about smells. 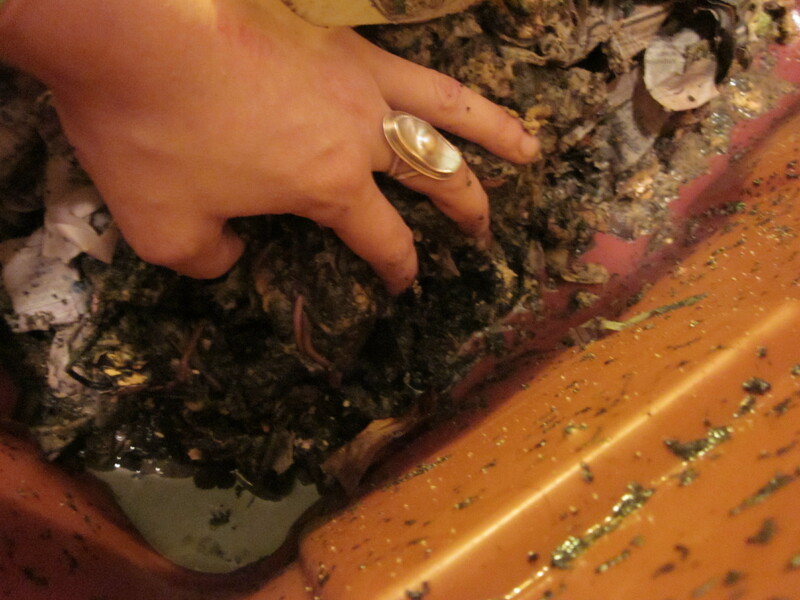 Successful vermicomposting systems don’t exude an odor; last year, I found this to be true. The system should be designed in such a way that the worms are able to digest the amount of waste put in the bin before it becomes notably pungent. Sometimes, the bin will have too much food or too much water, hence allowing it to smell rancid. Nowadays, when I open my white bucket of wonderfully decaying organic matter, it reeks. I’ve smelled a lot of compost in my day, and my bucket smells deliciously horrible. These worms better be excited. It smells because the food is decaying slowly, without aeration; the worms aren’t here to do their job yet. The odor lingers for a few minutes after I close the bucket, and eventually fades away. That’s the beauty of a closed system. It’s because of this bouquet of aromas that I’m particularly concerned about the first few weeks of worm feasting. Although they’ll arrive hungry from Pennsylvania, they won’t be able to eat all of my rancid food right away. I’m fairly confident that the stink will fade with time, but less than enthused about it wafting out of the ventilated bin, swimming around my closet, leaving it’s musk on all of my clothes. These babies better be ready for a Thanksgiving feast. Seven months ago, I moved out of my place in Vermont, packed my Honda Civic with nearly all of my prized possessions, and buckled my worm bin into the passenger seat. Although I’d done my fair share of traveling during the previous winter months, this would be the first time that the worms left the lush comforts of my (temporary) New England basement floor. As my worms and I drove through the beautiful Green Mountains, I came to the sad realization that the entirety of my life’s achievements would only allow me the feeble commitment of 500 red wigglers. Although at the time I had also owned a small plant for five whole months, I had yet to commit to larger things, such as a dog, a career, or an address that I could refer to for longer than 90 days. On a whim, I decided to stop by Brattleboro and go for a stroll. Logically, the worms would stay in the passenger seat, amidst the rest of my belongings. It was my kind of commitment. The plant, which fit in my cupholder, also stayed. That was February, back before my commitments got even more erratic. The worms stayed with a friend until they moved back in with me. We talked it out. Once tent season began, I drove the worms even farther south, where they would permanently reside in my mother’s new suburban vegetable garden. The groundbreaking ceremony was riveting– the combination of worms and decaying matter landed on our New Jersey soil with a thud. Although deaf, my childhood dog and I both knew that those worms would change my life.